Pleasure for the Empire: Let the Fun Begin! I keep wondering if I should stay on Blogger or move to Wordpress with my own server. The experience I had with Picasa frighted me into thinking that at any moment Google could decide this blog violates their terms of service and bop me off. The advantage to Blogger is that it's their bandwidth. 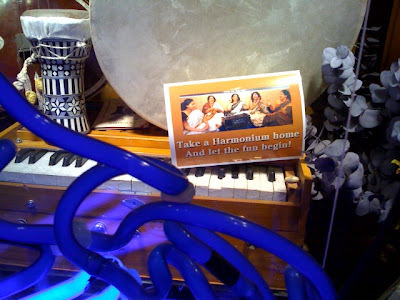 There is a "Musical Instruments Import" shop on 4th Street (mostly sitars and that sort of thing). This sign was in the window and it made me laugh out loud. Last night I went to the Kraine theater because the Neo-Futurists where having trouble with the sound system. Some bozo had changed out the speakers, resulting in a sound system which was continually overloaded. Once we realized that had happened, and there was nothing we could do about it other than to run the whole system at a substantially lower level, I left. It occurred to me that I wasn't putting out fires so much as containing fires. Then I realized I wasn't even doing that, I was walking in and seeing that there was a fire and then I said "That's hot, don't touch it."